You can use the feature to save multiple base queries. 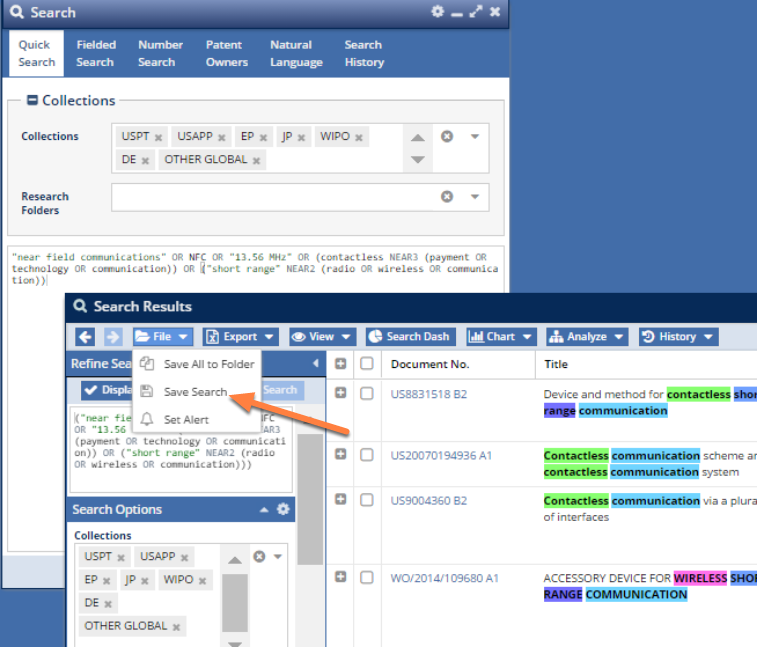 A base query is a search that contains all the keywords and strings that describe one specific aspect of an invention. To make your searches faster, it might be a good idea for you to build a library of relevant base queries, and save them to a folder called "Base Queries." This example is a base query about NFCs. 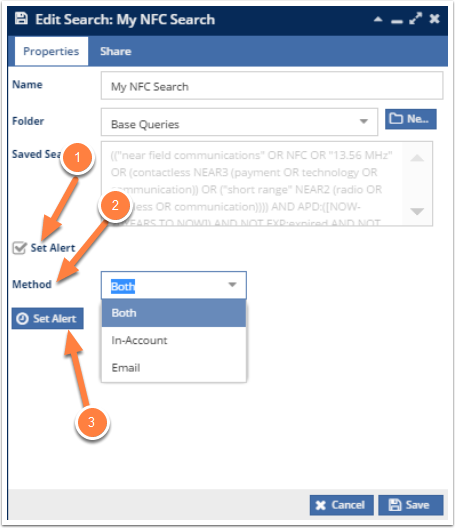 This would be a good starting point when searching any technology related to NFC (Near Field Communications) without having to research all the terms which mean "NFC." Just load your saved search. To create a new search, you would type your search string into one of the search fields. 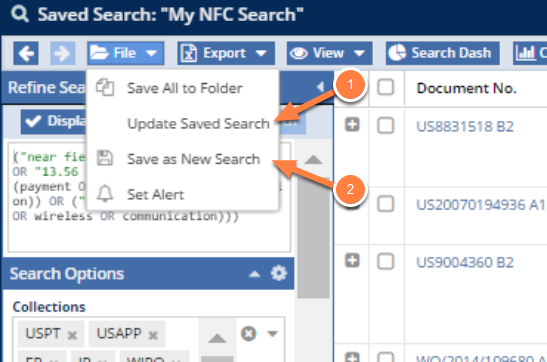 Here we are using the Quick Search tab to run the NFC search string. Once the search has been run, from the Search Results window choose File>Save Search from the toolbar, and a new window, called Add Search, will pop-up. In the Add Search window, you will have several options. It is recommended that you name your search a friendly name (1) so that you can remember later what the search is. In other words, naming your search "search one" won't tell you what it is. But naming your search "car door handle - right side" might be a good idea. Next, choose the folder where you what to save it (2). If you want to create a new folder, click the New button (3) and create the new folder. Then click save. The Search Options you have set when you save the search to your folders will affect the search every time you use it in the future. 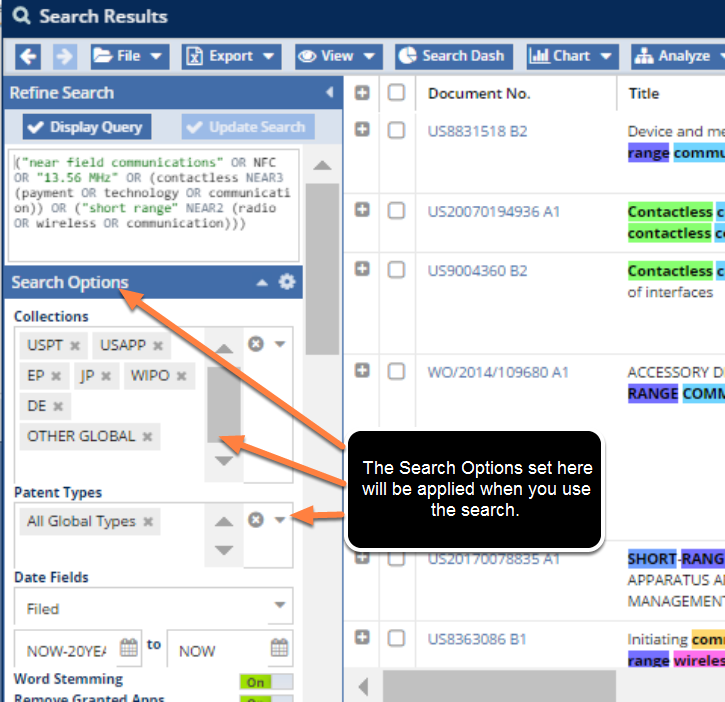 This means that the saved search will be sensitive to: collections you have chosen, patent types, date ranges, and options like Word Stemming, Remove Granted Apps, and Remove Expired Patents. This is just something to remember when using the search at a later point. If you want a specific set of search options, make sure to set them that way before saving the search. If you're just using your preferred settings, but you want the search run with different parameters, you may forget that the next time you need to run the search. 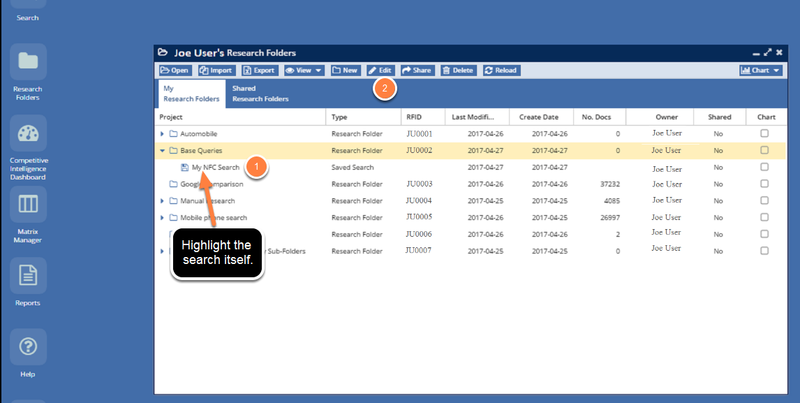 Saved Searches are stored in your Research Folders. Open the Research Folder window (1). Navigate to the search you want to run (2). Double-click the saved search (2). You can also make sure the search is highlighted and click Open (3), or right click on the search and click View from the pop-up menu, if you prefer. Note that there is no RFID on searches (4). 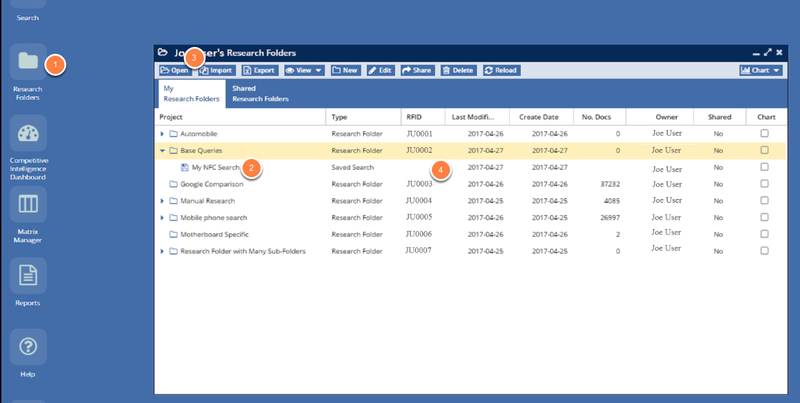 Saved Searches can be updated and improved, as you develop new techniques, in order to make them more accurate. Run a saved search using the process discussed above. Refine it with keywords, classes, or by applying some filters, and run it using the Update Search button. AcclaimIP will save the new search only after it has been sent to the search engine. So if you skip the Update Search step, AcclaimIP will not save your current search. 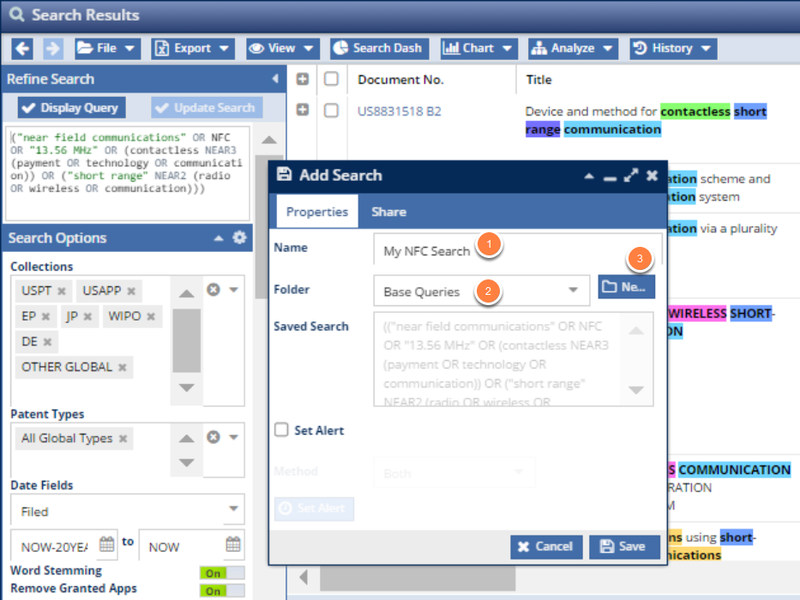 Instead, AcclaimIP will use the search already stored in the system. Choose File>Save as New Search (2) --> This will save the search as a new search, and leave the previous search intact. 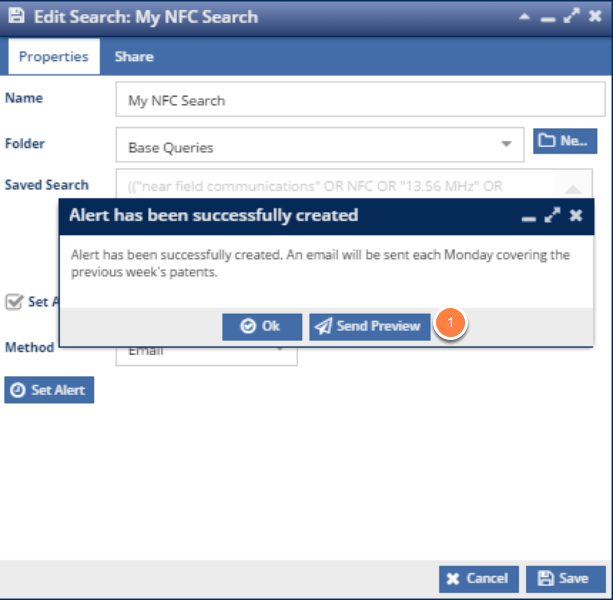 Alerts are based on Saved Searches. The principal difference is that setting an alert will automatically apply a date range query to your search and send you an email with the new patents that match your saved search only from the previous week. Single-click your saved search (1) and choose the Edit button (2). Alternatively, you can set an alert as you initially create the saved search, or by right clicking on the search itself and choosing the Edit option from there. All of these will give you the same alert options. Check the Set Alert (1) check box. Once this is done, you will see the Method (2) option appear. Click the Set Alert (3) button and your alert will be saved. Once you've set the alert (or updated it), you'll see a confirmation modal dialog window appear with the option to preview your alert. Clicking the Send Preview (1) button will send you an email showing you what documents the alert found. If you don't like the results, refine your query, update the saved search, and click the Send Preview button again. The click-through titles in the email alert are linked to our free site, FreePatentsOnline.com. 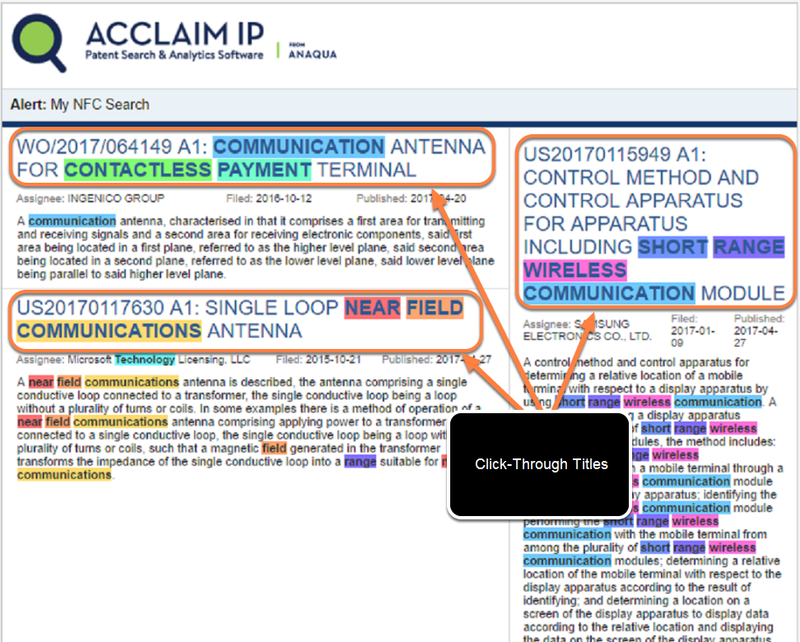 This way you can quickly review claims or other patent details without having to login to AcclaimIP AND you can forward email alerts to your colleagues and clients. They will not be required to have an AcclaimIP seat to view the patent details. By editing the alert itself and un-checking the Set Alert check box. By clicking the Discontinue Alert (1) option in the footer of the email you receive each Monday. You can set alerts based on Saved Searches. You can develop a library of saved base queries. These can act as your starting point for all future searches within your base technology. There is no limit to the number of documents that can be "saved" using a Saved Search. Saved Searches are dynamic. Each week new documents can match your saved search.